Okay, this is a really bad picture. Sorry. This card is made using a standard size of 51/2 x 41/4. The base is real red with a mat of DS from Summer Picnic. Then I made the center of the card a 6x3, score @ 3 in and fold in half. Top that with a 3x3 piece from Summer Picnic. 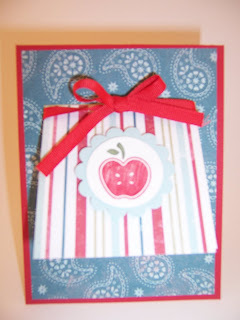 Punch A scallop from bashful blue, layer with a circle stamped with the apple from Tart and Tangy. I tied a ribbon using real red grossgrain 1/4. 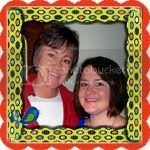 All materials are Stampin' Up!.